Just off Tassajara road you will find a grove of towering trees where camp sites create a friendly loop known as White Oaks Campground. In the center of this loop there is an enormous berry bush shrubbery and trees reaching up to the sky creating the visual heart of this intimate setting. Red Tail Deer and small animals can be seen eating berries and centering around the middle of the campground giving any camper a memorable sight to see. Each campsite is shaded by the natural growth of the oak and pine trees creating a sequestered and private feel. Very shady sites. Located in the Chews Ridge Recreation Area. Chews Ridge, from which the area takes its name, is a four-mile long spine in the Ventana Wilderness. The ridge sits at an average elevation of 3,500 feet, rising up to 5,000 feet at the fire lookout at its eastern tip. Along the ridge are views across the western ridges of the Ventana Wilderness and into the Carmel River watershed. The campground is located off Tassajara Road beneath a shady canopy of oaks and pines. The elevations of the campground ais approximately 4,200 feet. Recreational Vehicles no longer than 20 feet recomended. sustainable for the duration of your trip. There is no potable water onsite. 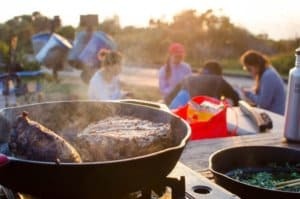 The campsites all have a good amount of space from one another and allow you to have the much-desired privacy and intimacy you want in a camping experience. The White Oaks campground is 2.7 miles away from the Pine Ridge Trail Head. From the campground you will follow the dirt road you drove in on to China Camp. You are under the coverage of enormous pine trees and shady oaks with the view of hills as far as the eye can see. The Santa Lucia mountain range spreads out as valleys and hilltops that you can never get tired of looking at. Once you hit the trail head, you have 23 miles of trail to explore. Hiking Trails and Mountain biking within 30 minutes. Day trips to the higher elevation and lengthy trails are about 2.7 miles from the campground.